Only just seen the Derbyshire article- assuming that's why the Kent game currently isn't happening? Greatest enemy, or best friend? Not that I want to hurt poor Leics. 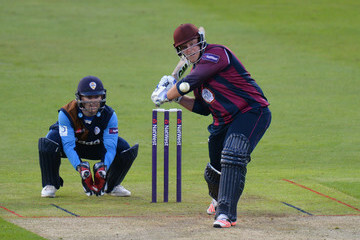 any more, but Cosgrove really needs to do a stint at Northants. before he retires. Thinking that England should pick Steven Mullaney as a specialist slip catcher for the ashes. The question is, are two Sidebottoms just a whole bottom? Good old Northants, 'My Big Fat Gypsy County'. You think the Sky Selection Panel saw that he isn't playing for his county!? @Dav3theRav3951 Just looked at the scorecard and Kallis was down at 9 in the first innings and 8 in the second. Didn't stop him scoring plenty, but anyone remember why he was there? @Dav3theRav3951 Was that Faf's debut where he and AB absolutely stonewalled it? Worst best figures you've ever seen? My vote is Jason Kreijza's 8-215 on debut. 12-358 in total. Am I the only person on here obsessed with Kumar's back lift ?